I am a last.fm user. Been an active user since March 2nd, 2008. For the uninitiated, what last.fm does is it stores my music plays and tastes and also recommends me music which I might like to listen, based on my tastes ... collaborative filtering + social community. So, they have revamped their site design ... added so many widgets (I had sported some on my blog) ... now they are allowing this data to be accessed through API!! What this means that the gazillions of programmers out there can come out with their own version of add-ons for this application. What that means ... is that there is a big pay load of data to be mined. 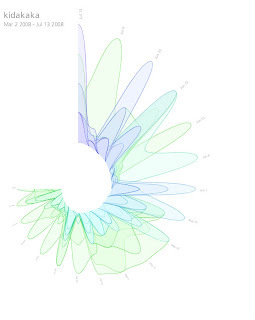 I saw this music spiral application for instance ... it generates my music spiral (dont ask me what it is) ... it looks pretty.